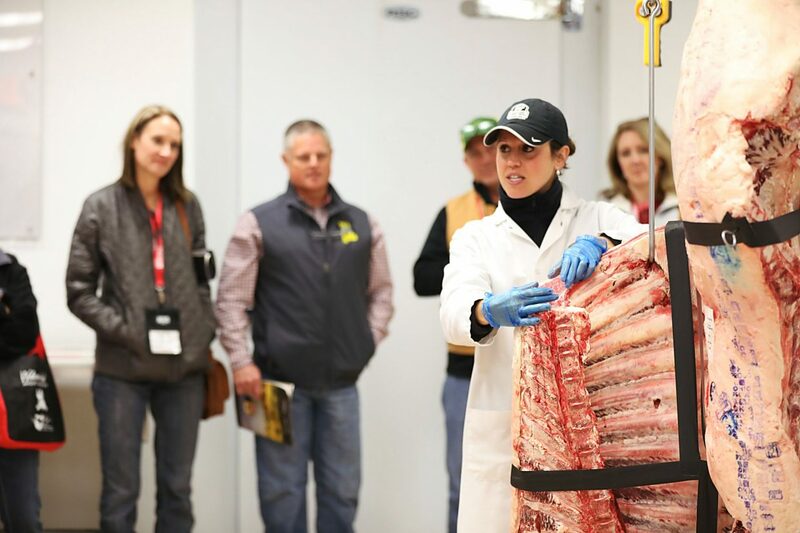 The brand’s 10 carcass-based specifications came to life when Diana Clark, CAB meat scientist, walked through them one by one with a hanging side of beef to illustrate. For the staff, it was a big family reunion, getting to show extended kinfolk from across the United States the Certified Angus Beef brand’s Wooster, Ohio, home. For Angus breeders, it was a bit like drawing back a curtain to see what happens behind the logo. “Everything we do here is to drive our mission,” said John Stika, CAB president, with a nod toward that goal of building demand for Angus genetics. He welcomed groups of cattlemen and women to the brand’s headquarters on Friday, Nov. 2, as part of the National Angus Tour and again for an open house after the National Angus Convention wrapped up on Nov. 5. “We are a full-service marketing organization. Anytime our partners need to sell more pounds … we do that here,” Stika said. CAB founding president Mick Colvin recalled some colorful stories that were “stumbling blocks” for the program early on. He brought a first-hand account to near brand-ending board votes and the U.S. Department of Agriculture cancellation. Those hurdles seem like distant memories now that CAB is in its 12th consecutive year of sales records, amounting to 1.21 billion pounds in fiscal 2018, he said. Guests roamed between the main office and Culinary Center, where they got a taste of everyday business as well as literally tasting why the brand they own is so successful. If breeders wondered what brand assurance was all about before the stop, they understood after Amanda Barstow, director of legal affairs, passed out beef samples during her talk on protecting the trademark. With a little pressure to rate those samples, people in the small groups shook their heads and admitted it was far from enjoyable. When Barstow revealed it was Select beef sold under a ruse as CAB, she didn’t need to emphasize why it’s so important to track and verify that businesses identifying their beef with the mark are selling the real deal. “The only thing we own is this brand,” she said. Barstow’s team pulls in the reins on reputation-ruining imposters. Just up the stairs, marketing came to life as volunteers engaged in role playing. A breeder posing as “Steve from Steve’s Steakhouse” was given everything from aprons and knives to social-media training and ad campaigns. The CAB staff kept piling on the tools for retailer and distributor, too. In another 10 minutes, the rotation paused at a big screen watching the “Rare Moments Done Well” commercial and identifying what red bubbles versus green mean in the company’s social-media-monitoring software. That illustration showed how the brand leverages positive conversations and helps mitigate negative ones. They made stops in the art department to talk about the significance of in-house printing, then learned value-added products philosophy in the test kitchen and saw a food photoshoot unfolding frame by frame in the audio-visual studio. Across the parking lot, The Culinary Center is used to visitors, but 400 during the course of a single day may be a record. That consistency is what drives value for all who market the product. In the dining room, Chef Tony Biggs shared bold ideas they’ve taken to the culinary world, from bringing back the “steamship round” that was popular decades ago to a chuck roll cooked tableside in a cocktail smoker. Guests shopped the extensive Black Hide Collection, the company’s branded clothing line, display and a free resource room stocked with new rancher-focused educational materials. The team also unveiled its new Cattleman Connection website (CABcattle.com) during the event. Stika said he hoped people left with pride in their brand and what their quality genetics have accomplished.